Eastern Meadowlarks in Harding Twp. 3 Eastern Meadowlarks are at Frelinghuysen Fields in Harding Twp. Also at the Fields this morning were numerous Savannah Sparrows, 2 American Pipits, Wilson’s Snipe, Merlin, American Kestrel and other typical species of the area. Eastern Meadowlark is a Species of Special Concern in New Jersey, both in its breeding and non-breeding status. While stable in certain grasslands of Somerset County (e.g. Duke Farms), the species is now difficult to find in Morris County with only a few sightings reported each year during migration and no known breeding locations as of 2014. This is quite a change from the New Jersey Breeding Bird Atlas of the 1990s when approximately 15 blocks of Morris County (i.e. 15 separate locations at least) had probable and confirmed breeding Eastern Meadowlarks. The list of Species of Special Concern in New Jersey is here. The NJ Division of Fish and Wildlife’s Wildlife Species of Special Concern in New Jersey web page is here. Frelinghuysen Fields is a property of the Harding Land Trust, a local organization created to “preserve the treasured landscapes” of Harding Township. 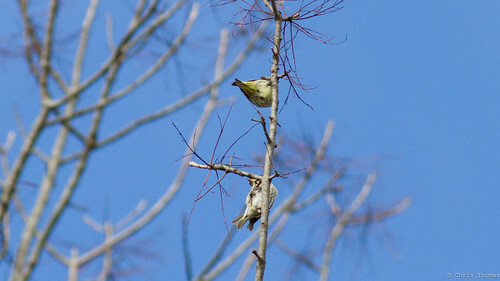 An Orange-crowned Warbler was seen near the pond at the North Gate (a.k.a. the closed bridge) on Pleasant Plains Road. Tennessee, Palm and Yellow-rumped Warblers, White-crowned and numerous Song and White-throated Sparrows were also present (Simon Lane). Pine Siskins and Purple Finches were at Troy Meadows this morning (Chris Thomas). Vesper Sparrow and White-crowned Sparrow were seen near the Community Garden of Duke Farms. Lincoln’s Sparrow and Purple Finches were observed at Glenhurst Meadows (Vicki Schwartz). Ruddy Duck numbers at Mt. Hope Lake (Mill Pond) continue to grow with 348 tallied this windswept afternoon (J. Klizas). View eBird checklists and other data at the following links.